As early as 1863 vocational training in carpentry, tailoring, shoemaking, printing, bookbinding and gardening were provided for a maximum of 30 boys by the Catholic Church led by Father Raimondi not far from Mission House in Wellington Street. In the 1870s up to 100 boys were taught carpentry, shoemaking and printing by Roman Catholic brothers in the Catholic reformatory at West Point. The Li Shing Scientific and Industrial College held its first prize giving in 1905. Although over 70 students had enrolled only 35 remained at the end of the course. The so named ‘Technical Institute’ was founded in 1907, which formed a sub-department under the Government Director of Education. It had no building of its own but was based in Queen’s College, then situated in Hollywood Road. Classes were run in the evenings and subjects included shorthand, sanitation, building construction and field surveying. Of the 161 students who entered local examinations in 1913, 116 passed. In 1926 the Salesian Fathers started classes in Commerce, shoemaking, carpentry, tailoring and printing, and, about the same time, the Taikoo Docks, situated at Quarry Bay, commenced evening classes for their apprentices. I remember Taikoo Dockyard, after World-War Two, as being a staunch supporter of technical education. They organized a well-run apprenticeship scheme which produced many skilled craftsmen. 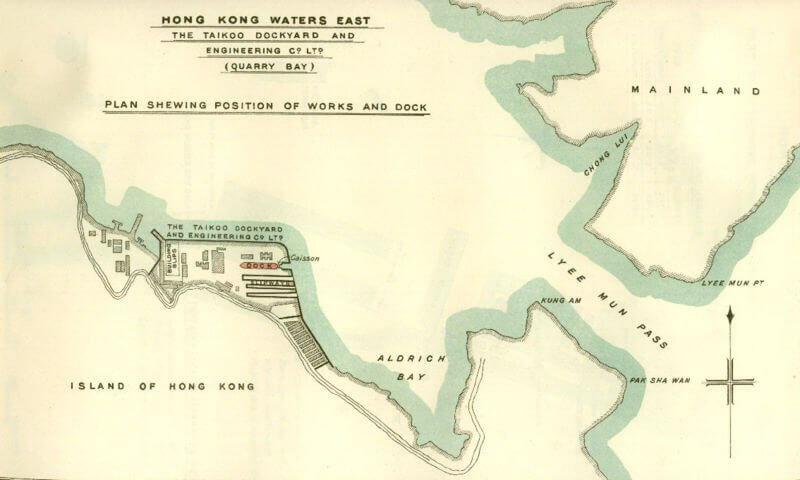 A map showing the location of Taikoo Dockyard built between August 1902 and August 1907. Up to then what was achieved in Hong Kong, in the scope of technical education and numbers of students, was limited. A more positive move was made in 1931 when the Government formed a committee under the chairmanship of Sir William Hornell (later to become Vice-Chancellor of Hong Kong University). It made three important recommendations. As a result, in 1932, the Junior Technical School (JTS) was established which was the government’s first venture into technical education. It provided a comparatively narrow four-year course mainly as pre-apprentice training for the engineering trades. In 1957 this school changed its name to the Victoria Technical School, and its scope of study moved to secondary education with some degree of technical bias. Further progress was made when the Catholic Salesian Fathers established the Aberdeen Trade School in 1935. This provided general education together with technical training comparable to an apprenticeship. I first visited the School in January 1955 and I was impressed by the standard of the projects on display. This Trade School was absorbed into the secondary school field in 1957 as was the JTS as explained above. The Far East Flying Training School, which trained pilots and engineers for civil aviation, was established in 1934. It was ensconced at Kai Tak alongside the old airport. The first government post-secondary Technical College was established in Wood Road, Wan Chai, in 1937. At the time of opening it ran classes in building, mechanical engineering (largely automotive engineering) and marine wireless operation. All this meant that, in December 1941, at the time of the attack by the Japanese, technical education was being provided at secondary school, trade school and at post-secondary levels, but all on a limited scale. Before the Second World War Hong Kong was largely engaged in entrepot trade and there was limited manufacturing. There was however, in addition to private shipbuilding and repair yards, the Royal Naval Dockyard which was phased out in the late 1950s. There was also a brewery, two sugar factories, Green Island Cement, tobacco processing, commercial ice manufacturing and the manufacturing of sweetened ginger– which was incidentally a favourite of Queen Victoria. When the People’s Republic of China came to power, in 1949, with the Chinese hinterland largely closed severely limiting trade, Hong Kong found itself in a position of export or starve. Early Post World-War Two products consisted of plastic flowers, the manufacturing of wigs came and passed quickly, and Hong Kong was said to be the largest producer of flashlights in the world. The colony also made plimsols and gum boots, enamelware and thermos flasks, and toys and garments. In addition, a very small number of manufacturers, such as Haking Wong Industries, moved into the making of higher class products, in the latter case good quality, reasonably priced, cameras. In 1947, after the end of World War Two, the Trade School (renamed Technical College) in Wood Road, Wan Chai, the Junior Technical School, the Aberdeen Trade School, and a number of private centres running evening classes were providing technical education which largely concentrated on theory. For many years the Catholic Tang King Po Middle School in Kowloon also ran a trade school section which organised classes in printing, shoemaking and tailoring. This trade school was phased out in the mid 1970s. It was decided that lower-secondary school pupils, at that age, needed general education rather than learning a trade. I joined Her Majesty’s Colonial Service in London, in 1954, and set sail for Hong Kong on the MS Canton. The usual mode of travel for government servants in those days was by ship, and arriving in Hong Kong harbour the stunning scenery, at any time of the day or night, was an unforgettable sight. A few civil servants came by seaplane, a journey which took five days. They only flew during daylight, and the plane landed on water and passengers spent the night in a hotel. Once in Hong Kong I was ensconced in Winner House Hotel, at North Point, and I travelled by tram to Wood Road, Wan Chai, where the old Technical College was situated. In those days there were two classes on the trams. The lower deck cost 10 cents and the upper 20 cents. The College was constructed of good quality facing bricks which had been imported from England. This was not unusual in earlier times as bricks and manhole covers were often shipped to Hong Kong as ballast. The college had been built at cost price by members of the Building Contractors’ Association on the understanding that sons of contractors could be educated there. 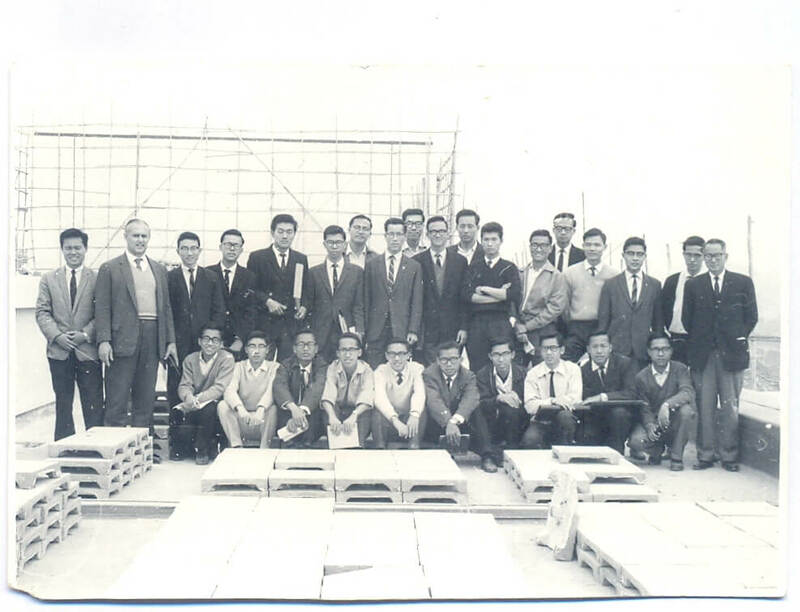 An additional floor was added to the college in 1953 making a total of three storeys. When I arrived in Hong Kong there were about 20 teaching staff at the Technical College which included around eight Britons. There were departments of Building, Mechanical Engineering (largely automotive engineering) and Telecommunications. A department of Commerce had been opened in 1953 and a department of Nautical Studies in 1956. A Textile Department started in 1957. Before I started teaching I spent 10 days touring industrial establishments accompanied by a fellow lecturer, Mr Ko Cheuk-luen. This I found to be invaluable as it allowed me to ‘get my feet on the ground’. After all Hong Kong was, in those early days, in many respects quite different to England. 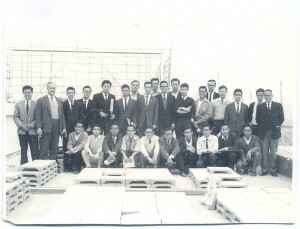 A group of Technical College building students on a site visit half a century ago. Dan Waters can be spotted, standing, at the end of the group. The College always placed emphasis on workshop classes and contact with industry. Full-time students were taken on regular site visits and they were attached to industrial establishments during the summer holidays. At the time the only University was Hong Kong University which boasted, among others, Departments of Architecture and Engineering, The second university, the Chinese University, was not established until 1963. This article was first published in the Indhhk email Newsletter 4 sent out on 7th February 2013. The Father’s full name was Timoleone Raimondi; later Bishop Raimondi. He’s said to have arrived in Hong Kong in 1858, at which time Sweeting claims there to have been a total of about nine private schools on Hong Kong Island, in addition to the 15 Government-run schools totaling 568 students (542 male, 26 female) as noted the previous year. The following year, St. Saviour’s college — forerunner of St. Joseph’s College — is said to have opened “near the Mission House in Wellington Street, with an entrance on Pottinger Street.” The following year, St. Saviour’s was host to the colony’s first public examinations. And some three years later, in 1869, Father Raimondi is said to have given a speech at a St. Saviour’s prize-giving ceremony wherein he addressed the issue of the large number of uneducated children in Hong Kong, whom he suggested could become 10,000 thieves. His solution: Compulsory education, comprised of a two-tiered system with trade schools for locals, and separate schools for the upper class. By late 1874, Raimondi had become bishop, according to Wikipedia. The following year, St. Saviour’s became St. Joseph’s. Raimondi isn’t mentioned again in the book until 1879, when it’s said that Governor Hennessy — himself a Roman Catholic — adopted suggestions by the bishop that would see Roman Catholic schools receive government grants, spurring their growth over the following decades. I have extracted the third paragraph and inserted it into a new article, West Point Industrial Reformatory – opened 1864, first technical education in Hong Kong.